A dry aged cowboy ribeye deserves respect, and that’s what we’re gonna give it: seasoned, grilled, sliced, eaten. 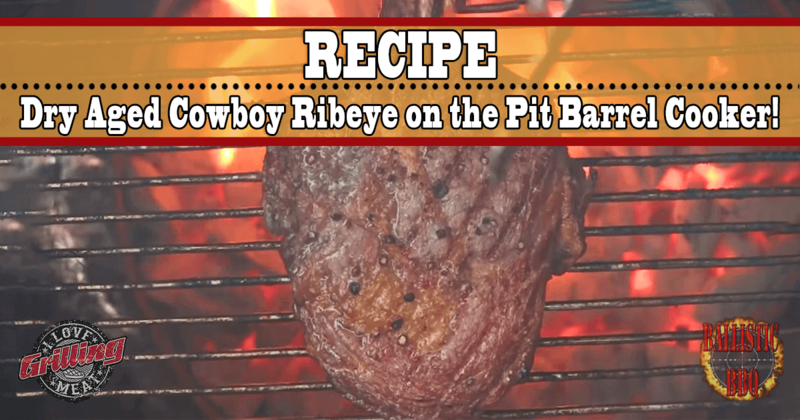 A simple guide for mouthwatering grilling steak (or anything else) on the Pit Barrel Cooker! Dry Aged Cowboy Ribeye on the Pit Barrel Cooker! The steak used here is a 2 1/2 inch thick Angus steak, dry aged for 35 days. If you want to learn more about the dry aging process, check out this guide. First up, let’s go over the absolute basics. Bring the steak out of the fridge at least 20 minutes before cooking it. Allowing the meat to come down to room temperature means the heat on the grill will need to work less to cook it. As a result, the meat will be more juicy and tender. Fire up your pit barrel cooker, until you have a nice bed of hot coals on the bottom. The distance between the coals and the grates on the PBC means no flare up will reach and ruin your food. In the meantime, give the steak a light coat of vegetable oil, and season with Kosher salt and fresh black pepper. Throw the steak on the grill. For a steak this thick, let each side cook for about 8 minutes. In any case, keep an eye on the internal temperature for your preferred doneness. When done, get the steak off the heat, lightly tent it with foil for about 10 minutes. The meat will reabsorb its juices and keep cooking due to carryover temperature. Only thing that’s left to do is slice and enjoy!